The biggest 3 festivals in Kyoto! Aoi, Gion, and Jidai. 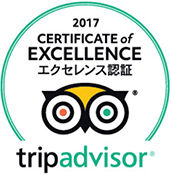 Maybe we have festivals every day including small ones in Kyoto, but the biggest 3 are “Aoi”, “Gion”, and “Jidai” festivals. Their beautiful kimono or floats called “moving museum” are worth trying. We often use the motives of these festivals for utensils or sweets in tea ceremony to imagine the seasonal scenes in Kyoto. It is an oldest festival of the three. It has remained the dynasty culture since Heian period(794-1192). All equipment such as an oxen pulling the gissha(ox-drawn carriage), clothes, horses wear leaves of Hollyhock, which is the origin of the festival’s name “Aoi”. The type of Aoi is “Futaba aoi”, which Kamigamo& Shimogamo shrines dedicated to the imperial palace every year.The origin of Aoi festival parade goes back to 1400 years ago when people were struggling with the crop failure by the violent rains and winds. It was the dedication to wish the good harvest and national peace. It is the elegant parade wearing beautiful Heian cloths. They walk about 8km from Kyoto imperial palace, walk through Shimogamo shrine and Kamigamo shrine at the end.Hearing AOI FESTIVAL, I remember the famous scene of Gengi tale written in 1008. Ex-girlfriend of Genji, Rokujonomiyasudokoro and the wife, Aoinoue had the trouble to place their gissha(ox- drawn carriage) in the good place to see the Aoi parade. It is really old festival in Kyoto.Regarding a tea Ceremony in Kyoto, I sometimes serve delicious sweets named “Goshoguruma”, which means “the wheels for gissha”. 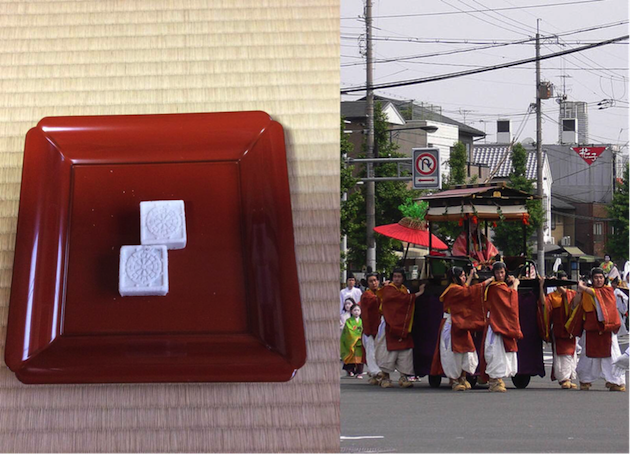 Seeing the traditional design of the sweets, I can imagine the elegant women wearing Junihitoe(Kimono for loyal family) and Aoi festival parade. The main event is “moving museum” in July 17th. Yama & Hoko decorated with imported gobelins clothes from Europe or traditional Nishijin textiles in Kyoto. The top Hoko is always Naginata every year, while other Hoko are decided to the order by a lot every year. Naginata looks the most powerful. In the later parade, maybe “ofuna book” re-built in 2014 after the long disappearance by fire is the most popular. 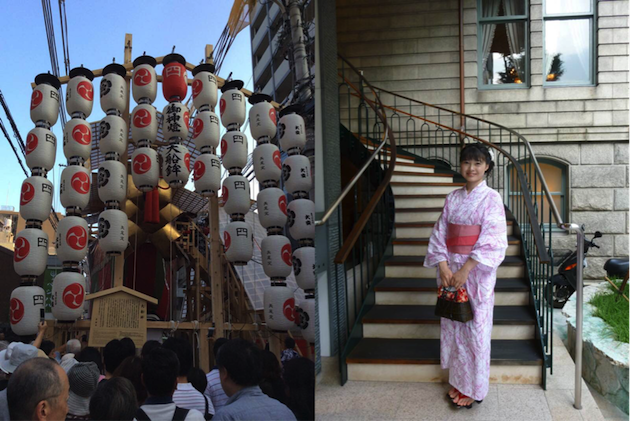 Shiori an: The beautiful old house of Yukata & Juban shop in Kyoto. 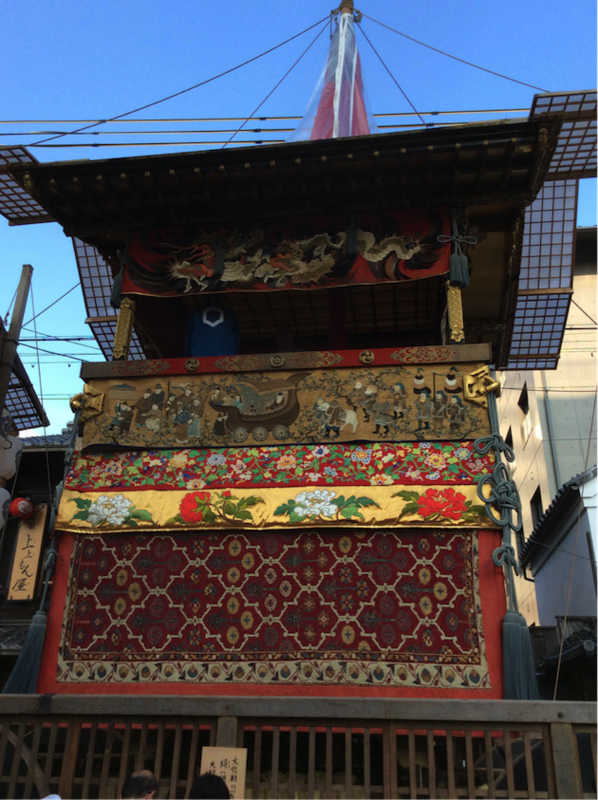 They open the house in Gion festival to show their old folding screens. We can see various samples of traditional yukata and Juban(underwear of kimono), from which we can imagine the long history. The doll decorated in this Hoko is said to keep his longevity by drinking a dew of　Kiku(Chrysanthemums). Tea ceremony is held in Kikusui every year (\2000). They explain nothing in English, usually just see the way of tea sitting on chairs, but they prepare the pretty plate shaped chrysanthemum of different colors every year. It’s famous for the wish spot for easy delivery. Girls in this area sell the amulets for the easy birth. It has a big carp on the top. It comes from Chinese origin, “Gateway of success”. The carp reflects the career advancements some people buy souvenirs with carps for good luck for job hunting or entrance exams. It’s the newest one of the three in October 22nd every year. It started in 1895 as the cerebration for the construction of Heian shrine and the anniversary of 1100 years since Kyoto became the capital of Japan Kyoto declined in those days because of the change of policy “Meiji restoration” in Japan, so Jidai festival was created to keep the traditional skills of Kyoto. All clothes are made under the Era historical research. 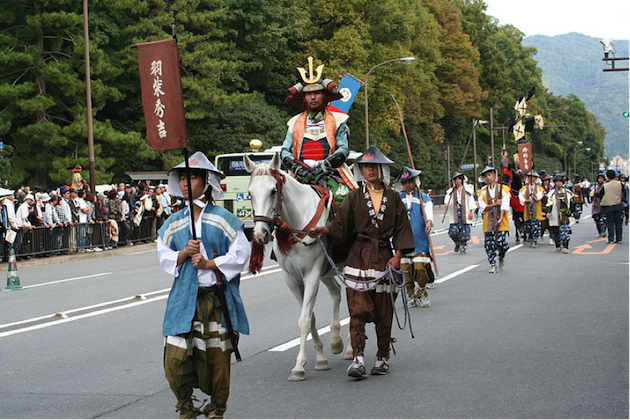 It parts in 8 eras, Meiji, Edo, Azuchimomoyama, Muromachi, Yoshino, Kamakura, Fujiwara, Enryaku and over 2000　people join this parade. It’s very interesting to see the difference of kimono of each era. On the day of the festivals, it’s hard to reserve hotels, but not only The day we can enjoy. Especially for Gion festival, we decorate some utensils or paintings in shops or houses to wait the day in Kyoto. Also in tea ceremony, we have sweets related to festivals and use tea bowls with the unique motives. Even in the small tea room, we can feel the seasons. It’s nice to adopt them into our daily life also!